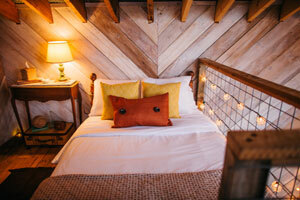 Catch some zzz’s in the trees in a rustic, relaxed setting and take glamping to new heights. Want to feel like a kid again? Escape routine to build memories with a loved one? Better understand the life of a squirrel? Don’t just look out the window at trees. Climb up into a treehouse for an overnight stay that takes glamping to new heights. 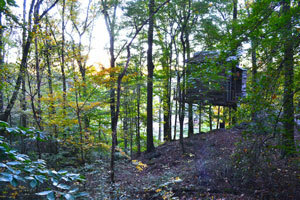 Treetop Hideaways, located near Lookout Mountain in North Georgia and just minutes from Chattanooga, Tennessee, offers an upscale treehouse that combines childhood fantasy with grown-up tastes. Built primarily of reclaimed wood and windows, the treehouse straddles two tall trees that jut up between the floorboards of the front and back porches. In between those porches and additionally supported by some beams, the two-story treehouse boasts a sitting area, bathroom and kitchenette on the main floor and a loft bedroom up a ladder that led to a hayloft in its former location. 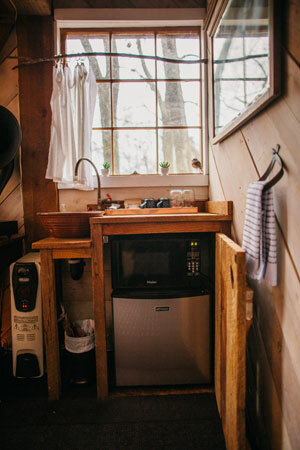 This not-quite-secret hideaway nestled in the woods has a playful vibe, yet offers conveniences you might reasonably expect of any hotel room. Your itinerary can be whatever you want it to be: You might book a stay specifically to experience sleeping in a treehouse, but you could also get out and explore nearby state parks or city life. 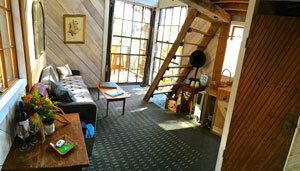 The inside space of the treehouse is as comfortable as it is imaginative. Tiny twinkle lights crisscross the beamed ceiling, mimicking stars. A pottery vessel sink in the kitchen is both practical and whimsical. The bathroom, which houses an eco-friendly composting toilet, has a floor that sparkles with a mosaic of copper pennies. Half a whiskey barrel serves as the shower stall; turn on the tap and water sprinkles down though a head fastened to the end of a curved pipe. A cushioned pull-out sofa can accommodate sitting readers or a sleeping couple. Up in the loft, a foam queen mattress seems guaranteed to invite deep sleep. Bar stools on the back porch allow you to perch and sip wine while looking a bird straight in the eye. Elwell and Alms opened Treetop Hideaways in 2015. Available on Airbnb, the current treehouse is routinely booked, so adding a second one makes sense. Alms was the primary builder of the initial treehouse. “As much as possible, we use reclaimed materials,” he says. “We sourced beams and massive windows from local industrial sites, and wood from three different barns.” To ensure year-round comfort, the treehouse is insulated and climate controlled. 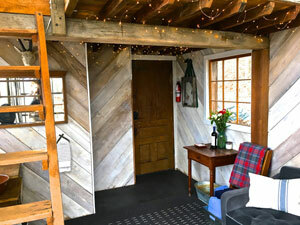 As cozy as the treehouse is, however, you shouldn’t spend all of your time hunkered down inside the hideaway. Lush with trees, the two-acre property offers a quarter mile of hiking trails to explore. There are sandstone boulders and limestone cliffs to discover. Perhaps most of all, though, the woodsy setting encourages you to retreat and relax. The stresses of daily life slip away as the wind rustles leaves, birds chirp and you savor the realization that “Yes! I’m staying in a treehouse!” Breathe deep nature’s aromatherapy. Take a nap. Read a book. Sit on the back porch sipping a beer and watching squirrels leap between branches. Canoodle with your travel companion or linger over long conversations. A fire pit near the treehouse is surrounded by Adirondack chairs. As the stars glisten in the night sky, you might light a bonfire then sit and sing campfire songs, share ghost stories or roast s’mores — everything needed to make the quintessential camping snack is stocked in the treehouse. If you crave city conveniences, then Chattanooga is mere minutes away. Also nearby is Lookout Mountain and Georgia’s Cloudland Canyon State Park. It’s a short drive to hike, kayak, tour museums and galleries, shop at major brands or boutique shops, sip local craft beer, dine, and much more. Like any great getaway, you can ultimately do whatever you want to do. All guests are greeted with a flowers and a gift bottle of wine. Other amenities include complimentary local snacks and beverages as well as binoculars, a hammock, picnic basket, cards, towels and blankets to borrow. The treehouse offers a “bird’s–eye view,” but expect to be pampered like a human. Published on June 27, 2017 in Georgia, Travel.